We’ve had a busy few days which has given me a lot to blog about. Let’s begin with Friday when I took Naomi in for her 1 year check-up. Her pediatrician said he can’t find a thing wrong with her. We were both thrilled. 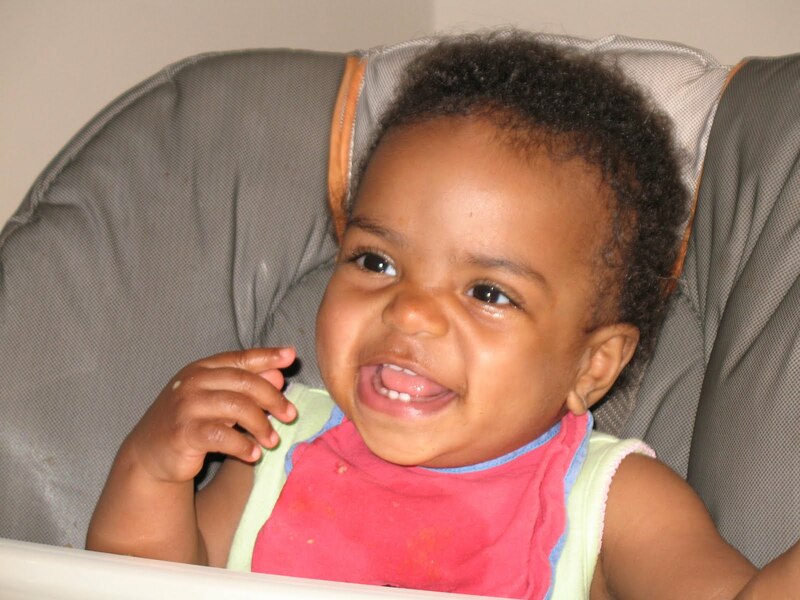 I had titers done on her when she came home and they came back showing no immunity. It was as if she hadn’t gotten any of her shots in Ethiopia. Who knows if she didn’t get them or if what she got wasn’t any good. Regardless, we had to start from scratch. This means she’s behind schedule so 4 shots later we left the office. She went into the office smiling and left crying. Poor baby! Because Dave had to work late and we’ve had a hectic schedule this week, we hadn’t had Naomi’s birthday celebration. 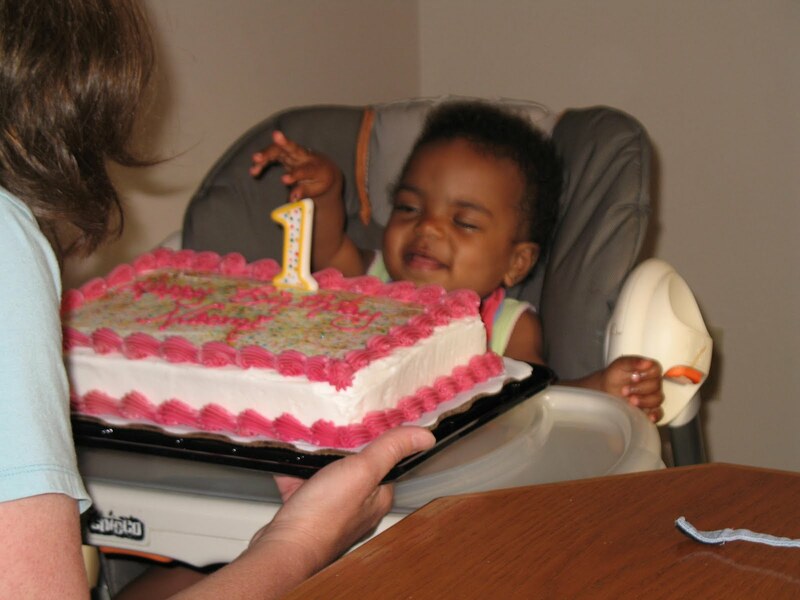 I realize that there are a lot of parents who really enjoy celebrating baby’s first birthday with a party and that’s great. I just happen to be one of those parents who feel that a party for birthday #1 is much more for the adults than the child. They really don’t understand the significance and the gift wrap and bags are much more fun than the actual gift inside. 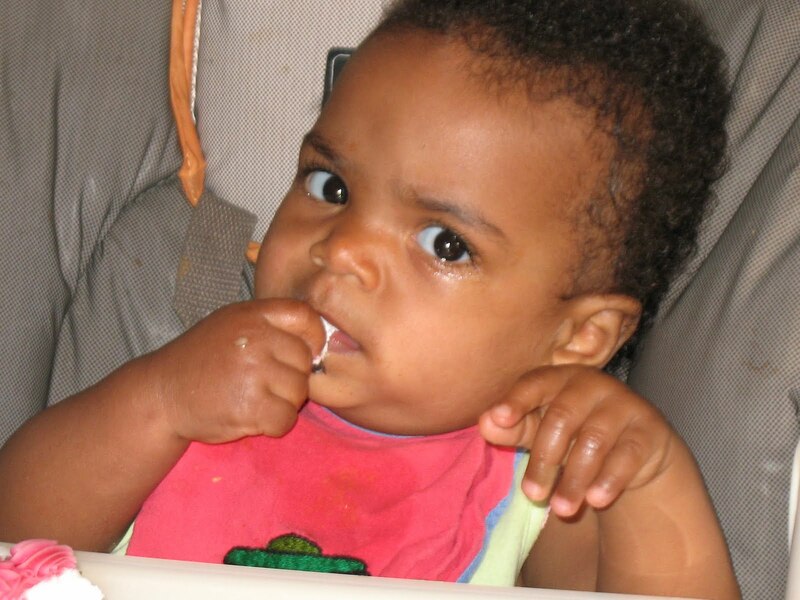 I do, however, enjoy seeing the face of baby as she digs into her first piece of birthday cake. And what a great photo op,so we had a small celebration with just mommy, daddy, Lili and of course the birthday girl. The birthday girl as we were signing Happy Birthday to her. And with her first birthday candle, which she apparently though should be extinguished with her fingers. Don’t worry, no flame was touched by little fingers. Then her first taste of icing. Yeah, this birthday cake is good. 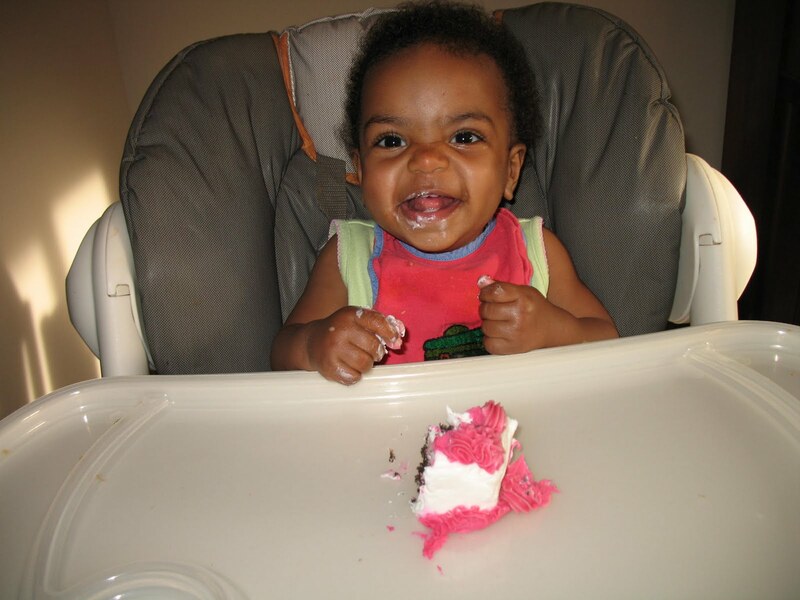 I love my cake so much I’m going to give mommy and daddy the cute look. 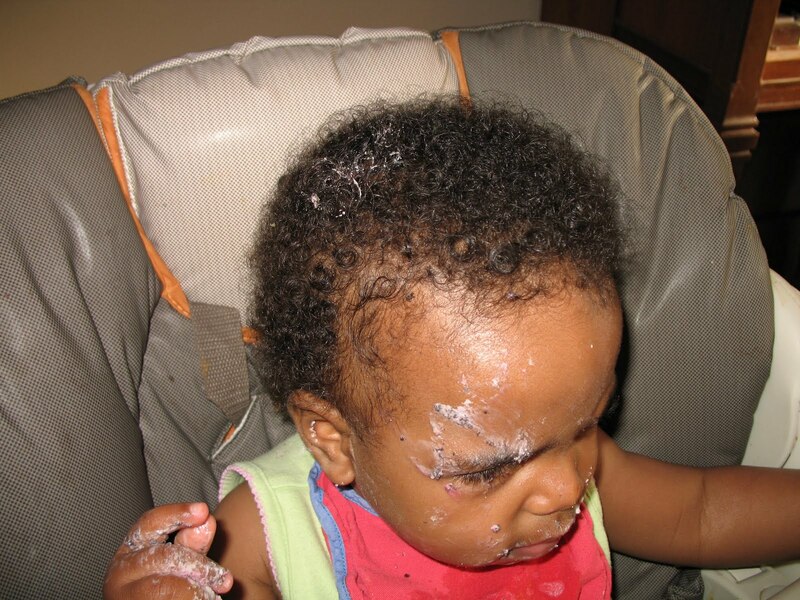 Did you know that birthday cake is a great moisturizer for the face? 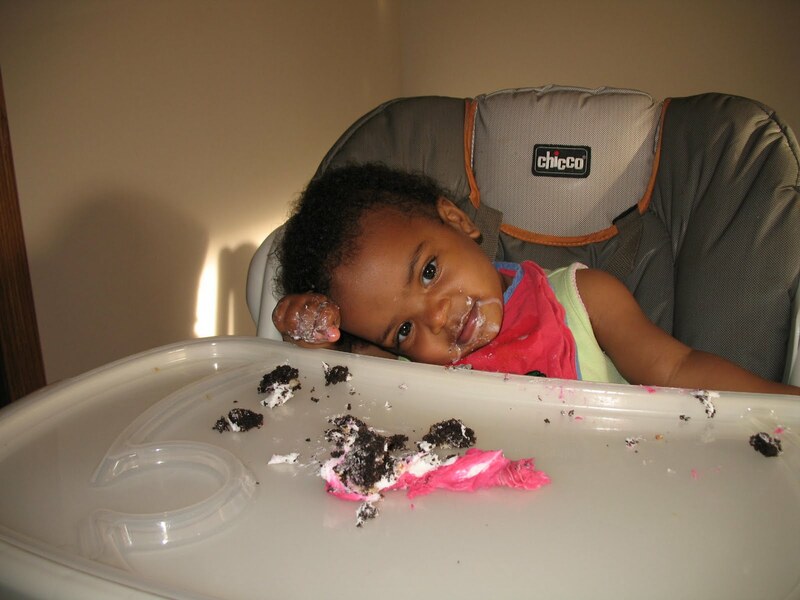 Yes, I do love seeing a 1 year old dig into their first birthday cake. Oh I just want to eat her up, or maybe it is the icing, no I think it't the cute little cheeks. LOL! It was great seeing you guys yesterday and meeting Josh. See you Saturday. She is just such a cutie! What a fun way to celebrate her birthday! 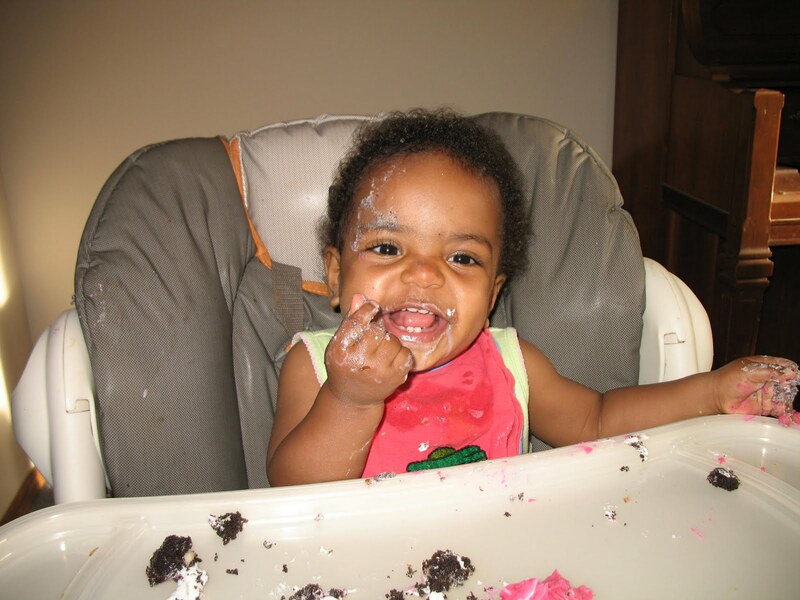 (We only do family celebrations at our house) I think she enjoyed the cake. Sounds like she is growing up into a healthy, happy little one! So adorable, but don't you hate trying to get food out of that afro. Haven drives me crazy with mashed potatoes! They always end up on his head.